The Mali are traditionally known as gardeners. The word Mali is derived from the Sanskrit word 'mala' (meaning garland). Many are called 'phool' Mali, referring to their well-known occupation of growing flowers. There is at least one group of Mali from Rajasthan who are considered to have originated from Rajput or warrior tribes and who are of a higher caste. The Mali are industrious workers and are known for their bravery in the disciplined forces. Generally, they are differentiated according to their occupations. For example, those pursuing gardening are known as Baghban, those who cut and sell grass are called Sasia Mali and those growing flowers are Phool Mali. Many Malis live in towns and keep vegetable or flower gardens in the outskirts. The Mali are also known for the preparation of 'Maur' or marriage crown both for the bride and the bridegroom at marriages. Marriage is forbidden between members of the same sect or first or second cousins. Unlike some Indian traditions, marriage of widows is permitted. The dead may be either buried or burnt. In the former case the corpse is laid with the feet to the north. 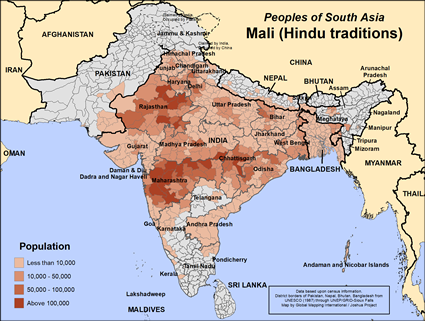 The Mali are mainly Hindus. Devi is their principal deity and marriages are performed in front of this deity. Devi is a local incarnation of 'Maha Kali', the warrior goddess and consort of Shiva. Animals are sacrificed to please her. 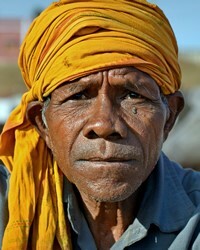 The Mali need to know Jesus as their saviour. Devi is believed to require appeasement through offerings and the goddess incites fear among her followers. On the other hand, Jesus is merciful, forgiving and loving. * http://en.wikipedia.org/wiki/MahakaliView Mali (Hindu traditions) in all countries.